Really funny stuff! 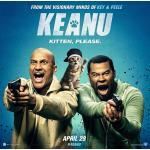 African Americans, who always conducted the righteous life, once find a small kitten Keanu, which is kidnapped for some reason by a nasty band of really tough motherf**kers. And these two will try to look like gangsters trying to save this cute fluffy kitten, who so amazingly nicely yawns. This is comedy, parody on all this very tough movies with harsh persons who shoots before thinks. George Michael here is provided as an attraction of one of main black fellows and he so devilishly funny sings his Freedom! '90 than you just pee your pants! These two main fellows here are Key & Peele – the ones who participate on Comedy Central channel with their short sketches, on several minutes. We must admit that they are really nice actors and though their stories not always very funny, but they still amuse.